What is this that stands before me? Little black box that blinks at me. With green LEDs. 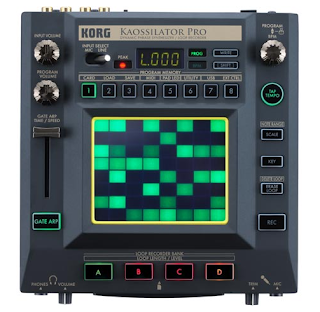 It’s been about 10 years since Korg's Kaoss pad had muzos scratching their heads thinking: “Well, it doesn’t look like a synth. Or a MIDI controller, for that matter. Where’s the keyboard? The array of knobs and sliders? And what’s with the light-show?” While X-Y controllers feature on many a keyboard synth these days, to have the primary means of note input as merely a backlit X-Y touchpad initially confused folk more accustomed to plonking away on piano keyboards. With the original Kaoss pad, manufacturer Korg was actually making a kind of point, the point being that there must be a more spontaneous means of making music. At least, more spontaneous than having to spend an age learning how to tickle a tune out of the ivories. Non-pianists and DJs (ie, glorified record players) took Kaoss to their hearts, however. They rapidly realised that knocking out a tune did not have to entail mastering the art of bashing a row of black-and-white buttons. Kooky composers also embraced Kaoss and its potential for experimental musical musings. 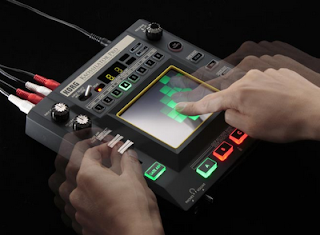 Korg copped all this and continued development, arriving this year at its most chaotic Kaoss yet, the Kaossilator Pro. Let’s just establish what the Kaossilator Pro is not. Traditional? Certainly not. But is it a MIDI controller; synthesizer and sampler; phrase and loop sequencer; DJ performance tool and beatbox; creative composer and sound-designer’s groove gadget? Well, yes. All that and a few things besides. While initially tricky for the trad musician to get his or her head around (a flashing X-Y touchpad, fer chrissake? ), a scan of the specs reveals interesting items indeed. The 200-patch capacity, PCM percussion samples based on Korg’s other muzo’s weirdo, the Electribe MX-1 pattern sequencer, the means to stack loops on the fly in four banks, 15 vocoding FX thanks to a mic input, a gate arpeggiator, USB and MIDI connectivity for DAW control and, of course, the pretty flashing lights of the touchpad... There’s a fair bit to be going on with. OK, you should have a reasonable idea of the Kaossilator Pro’s possibilities by now. However, there’s a few groans I’d like to gripe about. Both stereo line in and out are RCA, hence unbalanced, so studio users are going to have to watch their audio cable runs lest RF interferes. The same goes for the 1/4-inch mic input socket. No TRS or XLR, hence no phantom power, hence no balanced condenser. Then again, you’ll likely be using mic input to take advantage of the vocoder effects, so pristine vocal audio quality may not be too much of a concern. Many DJs will be accustomed to RCA connectors, but may not take too kindly to the fact that there’s no monitor bus. So auditioning a, ahem, ‘phresh’ sample on the cans is a no-no during improv when playing live. You’ll just have to plan ahead a little when getting a set together so as to bring in a loop right on time. And make sure your samples are of the right length for the BPM. The Kaossilator Pro handles both WAV and AIFF, which are stored on a SD expansion card, but they have to be 16-bit, no more, and maximum card capacity is 2GB. It’s a good job you can bring in your own sounds, either via pre-authored file or recorded using line-in or the mic, because some of the default timbres are somewhat on the limp side. Although if you’re hooked up to a Mac or PC via USB connectivity, then there’s access to the KPro’s editor/librarian software freely downloadable from the Korg website. Not only does it enable you to perform deep voice editing, it means you can back up all your work to computer ready for later recall, as well as use DAW software to run the machine, effectively turning it into a hardware synth. Let us also not forget MIDI connectivity (the cross-platform MIDI and USB drivers are also freely downloadable). So it’s possible to trigger the KPro and alter a good many settings, such as which loop recorder bank is running, which of the eight program memory buttons are activated - you can see them laid out left to right above the touchpad - twiddle with the behaviour of the touchpad, alter tempo and modify something that Rich didn’t touch on in the above vid: the gate arpeggiator. This vertical slider to the left of the touchpad is one of the more powerful doobries on the device. Hit the Gate Arp button and wang the slider up and down to alter the speed at which sustained sounds stutter, adding welcome rhythmics to drone tones, as well as hacking up percussion patterns a treat. It’s a feature adapted from the aforementioned Electribe and is a hoot to use. MIDI Out also means the Kaossilator Pro can function as a hardware sequencer, feeding data to whichever MIDI device you have attached, such as a keyboard synth or other tone module. Something that’s not so much of a hoot is getting used to the action of the X-Y touchpad. Sliding your finger around oft produces, let’s say, chaotic results. Trying to play a meaningful melody is a faff until you’ve had good practice, although it does take you off in compositional directions that may never occur when dabbling with a keyboard controller. And let us not forget that it offers ready, slidey manipulation of such groovy parameters as modulation depth, filter cutoff and so forth. It’s just a shame that it’s monophonic, so no multi-digit chordplay here, then. More of the Kaossilator Pro’s spec, including the entire user manual, can be had from Korg’s website, so soak up the gen, then hit your browser’s back button for a few ponderings on where we’re at with Kaoss theory. Korg is best known for its keyboard products, so why develop a machine that wipes the 88-key smile off an instrument’s face? The company’s own blurb has it that music should be inclusive. That is, aspiring muzos with the keyboard skills of a retarded rodent, such as the DJ, drummer or guitarist, should not feel left out when expressing themselves with synths. And quite right too. As a guitarist with a penchant for synthesizers, most of my sequencing is done using a keyboard that has QWERTY printed on it, plus a completely non-sentient, three-button rodent. But I rather like the compositional randomness made possible by this sixth Kaoss pad. While I’ve quibbles, already mentioned, about aspects of its tonality, ease of note input and audio connectivity, the Kaossilator Pro is just plain fun to use and has inspired some truly left-field fodder for my compositional collection, albeit largely by accident while making the KPro’s acquaintance. The price-point ain’t too bad, it’s an easily integrated adjunct to the project studio, and those pretty green lights... Mmmm.